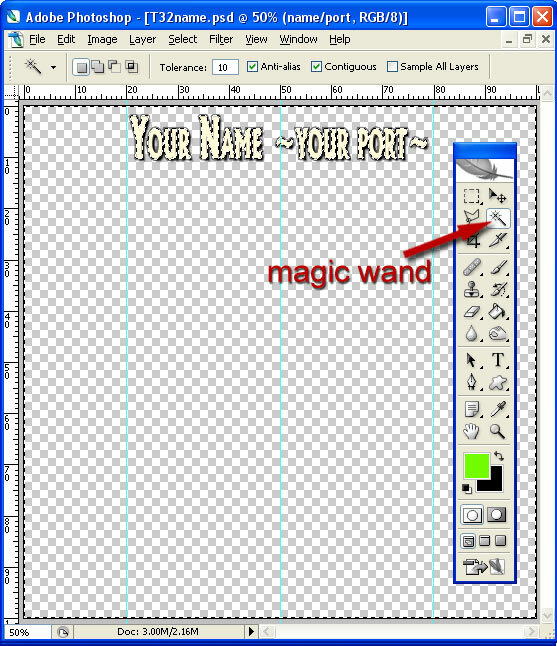 If you do not have experience or familiarity with 3rd party graphics applications or feel any of this is out of your comfort zone, please contact Jaqueline Trudeau inworld and I’ll forward some names of those who can create your naming graphic for you. 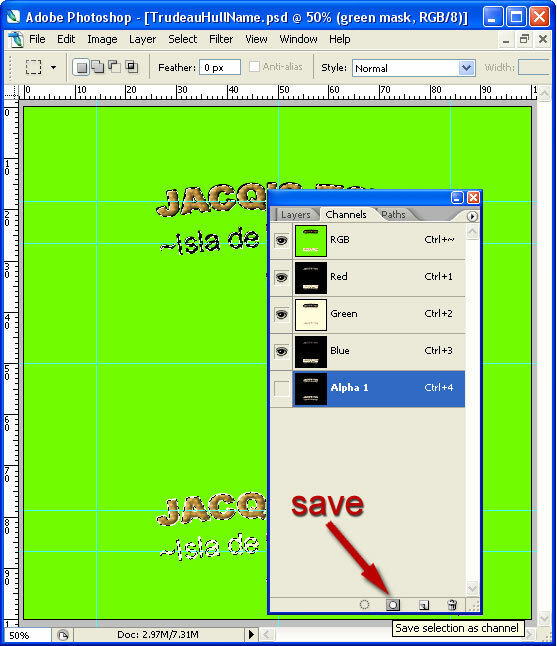 Now save your graphic as a 32 bit Targa file (don’t check Compress!). Select it to apply your name. Voila! Stand back to admire your work – it’s beautiful, isn’t it? Save it back into inventory and our work is done here! The Trucordia Life Ring is somewhat easier. Download the template here. And save the image as a targa – 24 bit this time, as there is no alpha channel. Upload the image to Second Life, apply to the outside faces of your Trucordia’s life rings (you are getting to be an old hand at this!) and you are done! Naming Larinda is essentially the same as the Sea Sharp procedure, except use this template. Tradewind (template here) also follows the same procedure as Sea Sharp, etc. 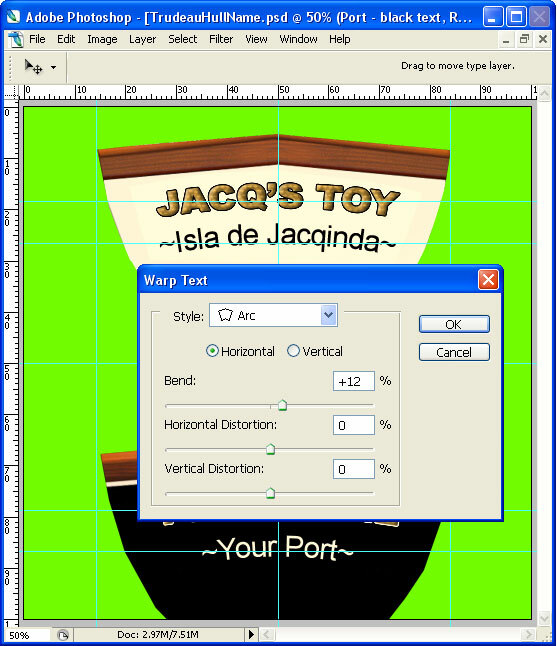 except there is only one set of text layers – they always display over a fixed hull texture color so the texture offset script is not needed. Click OK. Now delete the existing Alpha 1 channel and save the selection as a new channel as explained in the Sea Sharp instructions. Save as a 32 bit targa, upload to Second life and apply to your Trudeau 32. 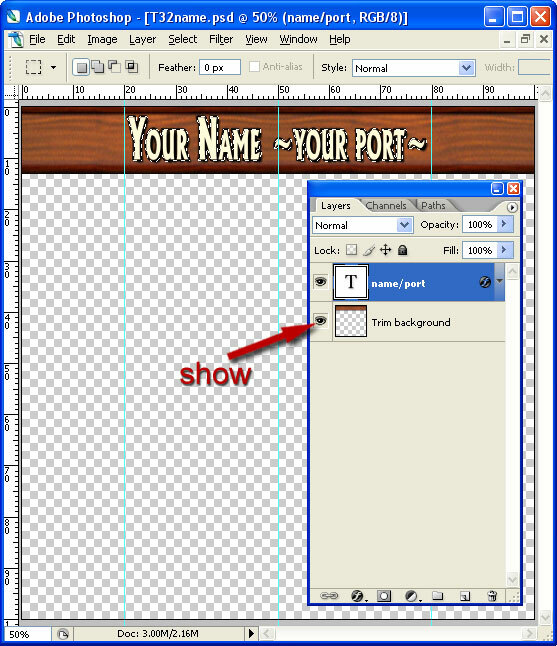 Naming Tahiti Ketch is relatively simple – just open the template, keep the name and port text within the guides and background. Save as a 32 bit targa, upload and apply. Even simpler. 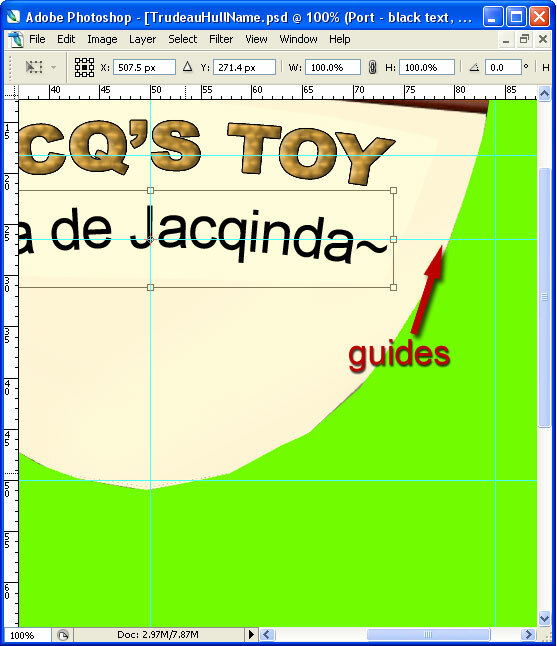 JacqCat’s template is here, Friendship’s is here. Just open, modify the text and keep it over the background. Save as 24 bit targa (no alphas on these), upload to Second Life and apply to your boat. Thanks for this site, very cool to be able to customize my boats. Hello, are there any templates available for the Twenty or the Knockabout Sloop? Yey my Knockabout and my Tahiti have now their names!!! thanks a lot for this instructions!!! this is great!!! Are there any templates for Leetle Cat? Do you have instructions for renaming the J-Class? I’ve got the files but not the instructions like you have here on this page. Hi Naeve, I haven’t updated the J-Class naming instructions. But it couldn’t be easier! 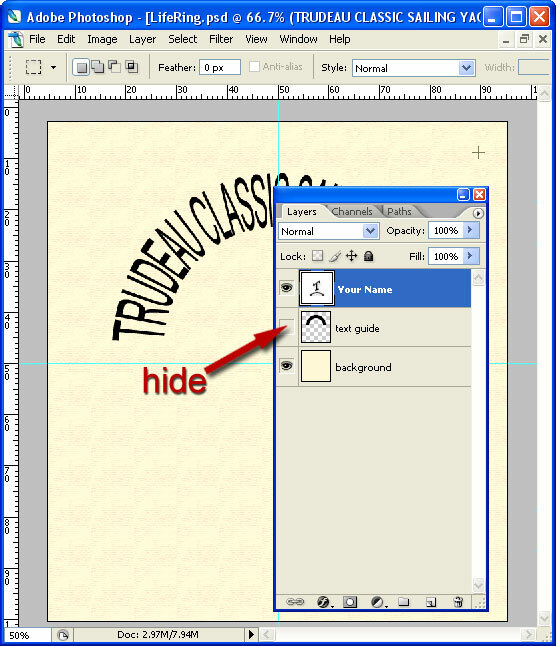 Just upload your version of the template to SL as a TGA and drag that graphic over the prim face that has J-Class’s current name – on the side of the skylight. I want to customize my Tradewind but I can’t seem to find the templates for it anywhere. Have they been published? I don’t mean to sound too silly, but I don’t have much building experience so please pardon my possibly ignorant question. I’m also totally ignorant about changing sail textures for the same reason. 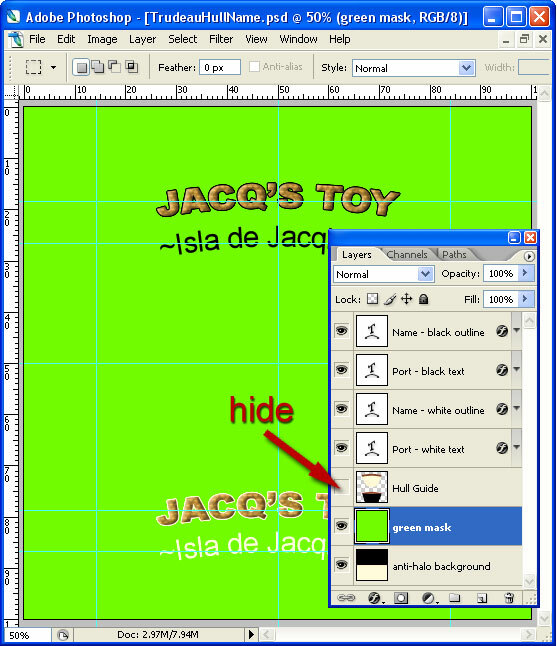 Is there an easy way to change sail color or to add a custom color design? Hi Ian – good question. The naming prim is a regular old SL(tm) cube – dragging a texture on it will only effect the face of that particular prim. 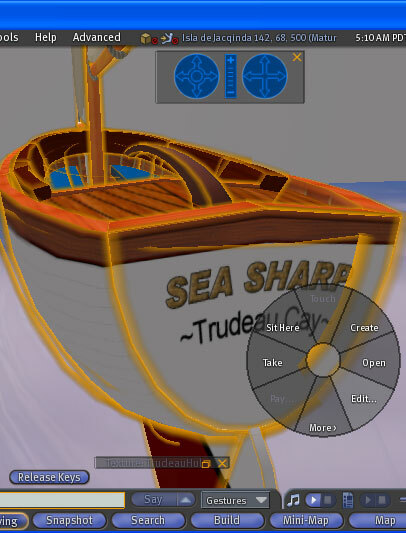 However, if you were to select the entire boat, edit it and drop your name on the Texture window that would indeed replace every texture on the boat with your name. 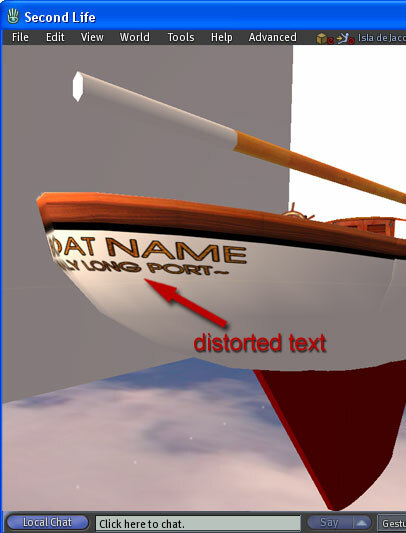 In any case, the boat is copy – if you mess one up, just delete it from inworld and rez a fresh one. 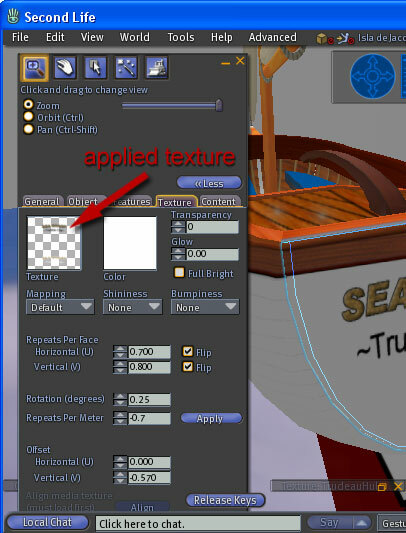 As far as sail textures go, that is accomplished by editing a script within the sail prim. 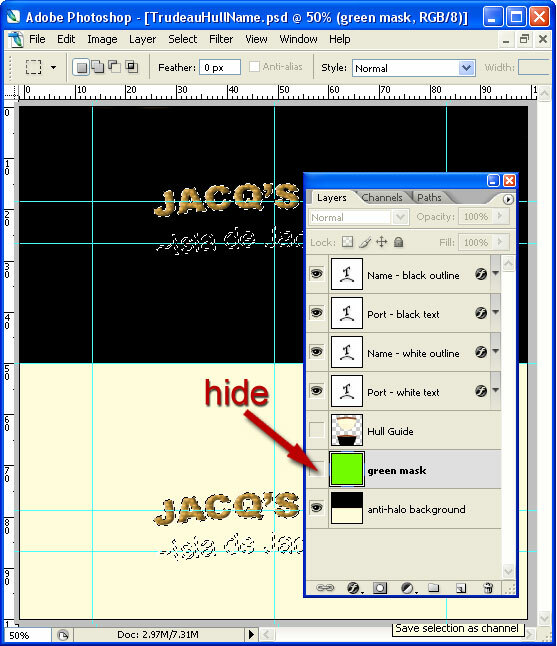 The instructions are part of the sail template download. Hello, thanks for these instructions. I think the anti-halo layer for the Knockabout Sloop PS file (knockaboutname.psd) is wrong though. Should it be completely black? Hi Retro, I think that would give a faint black outline around the text edge that is white. I could be wrong though. Thanks Jacqueline! I forgot to return and read your comment until now. 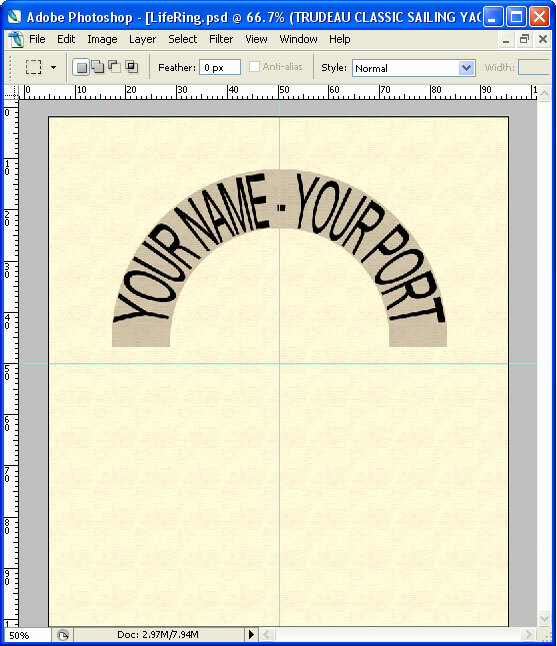 What I should have said was that the anti-halo layer in the knockaboutname.psd file isn’t completely black or white (as in your other yacht-‘name’ files), but has some hand-drawn marks aligned to one side of the words ‘knock about’. 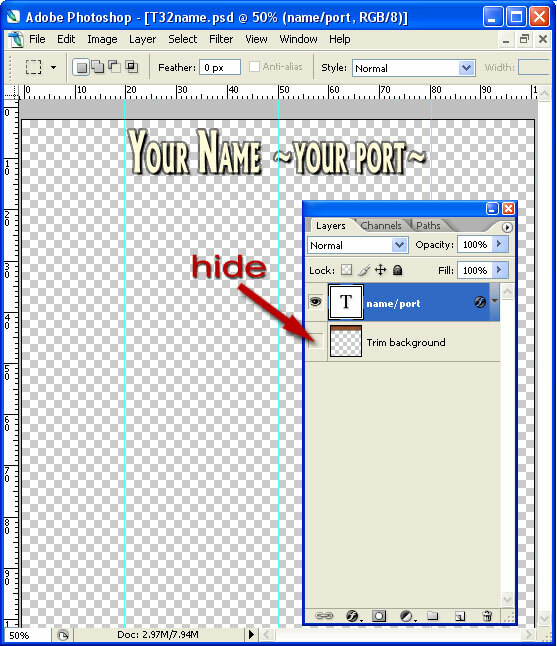 So once the name is changed, the anti-halo layer in that particular file no longer fits. I later realised why you did that though – to prevent a halo around the drop shadow effect. It was trivial to fix and I was typically slow to realise. Doh! Sorry about that. I have offered to help a friend name his Patchogue. We have sail templates but not the naming one. Could you tell me if one is available? I just bought the new Columbia, but cannot name her! Unlike the J-class the small roof has not a single block-prim for naming. Please help me and other Columbia-owners out! Hi LuDo, the name is part of the texture that wraps the deck skylight (I ran out of prims for a dedicated one for the name). 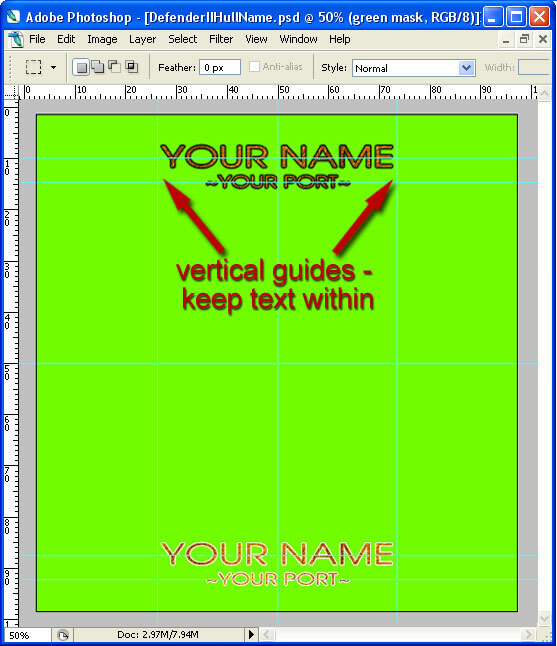 You can download the template from the link on the Columbia page – the naming font layers are on it. The only tricky part is that they are oriented vertically. 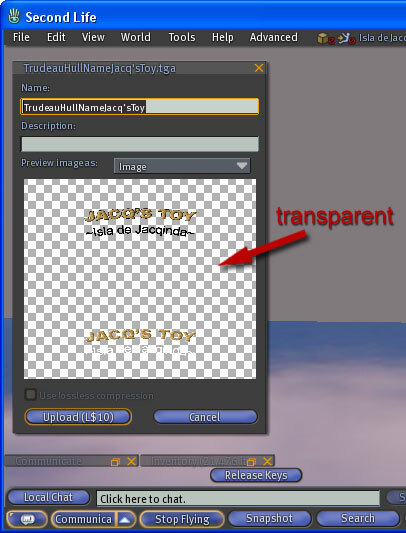 A tip for Photoshop, instead of using TGA format for transparent images, use PGA, you wont get the halo. Works in SL. Hi, I first should tell you that I was absolutely new to photoshop when trying to rename my Rozinante. Unfortunately there are no specific instructions for that boat, so I used the provided template and the instructions for Sea Sharp. It turned out quite well, only I always end up with a black line left of the new name (seen from the portside) that goes all the way to the other side. Could someone please tell me, what I might have doen wrong? 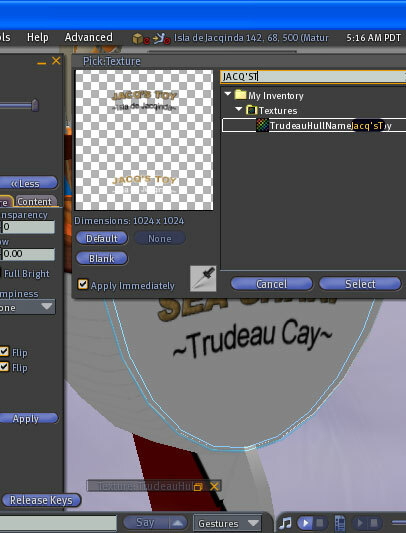 Hi, I just purchased a Trudeau One, I downloaded the name template and changed it as instructed, and uploaded it back into SL. Looks fine. 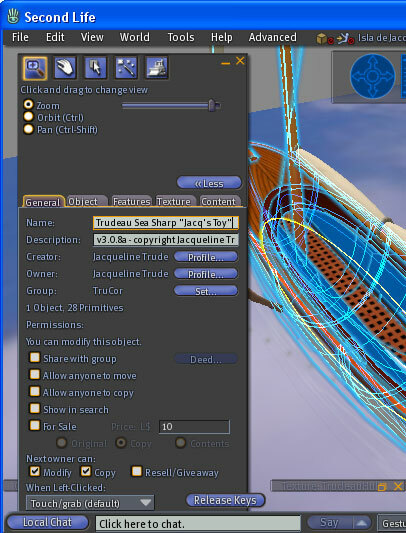 Now I am trying to apply it but I am unable to select just the name on the stern, the entire boat is selected and I get ‘multiple’ in the texture display window in the edit popup. Can you please advise exactly where I need to click? I use the Phoenix Viewer. Ahhh, belay the last, silly me I was using the wrong button, had position rather than select texture set :) All fixed thanks. Wonderful boat by the way. 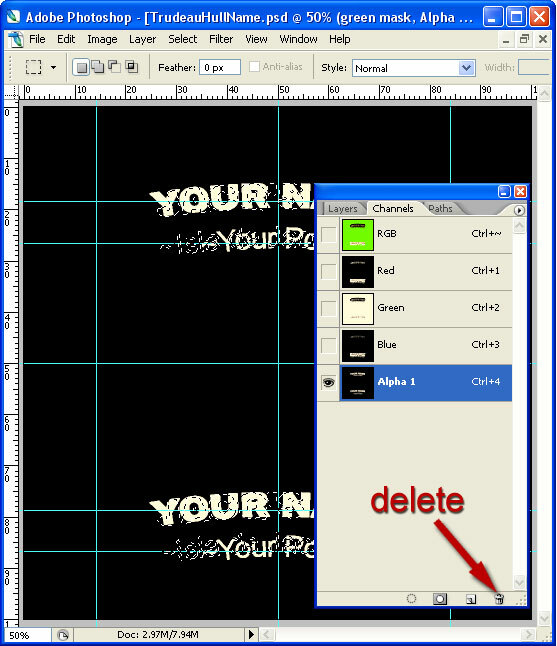 Can anyone provide renaming instructions using Pixelmator or Gimp instead of Photoshop? I’m taking a look forward for your next put up, I’ll try to get the cling of it!